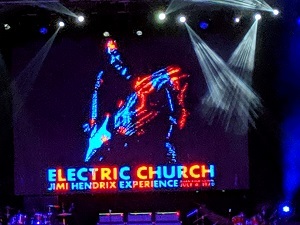 The Electric Church arrived in Albany, NY last night with its all-star cast for the Experience Hendrix 2019 Tour. The music of Jimi Hendrix continues to thrive and be embraced by fans worldwide. This is a tour I have been wanting to catch for several years now and I finally made it, and so glad I did. The best thing that could happen to this event is the involvement of Billy Cox. Anyone familiar with Jimi’s music knows that they were friends for a long time and Billy played bass on some of Jimi’s albums. Also, with Janie Hendrix involved it makes everything legit. Also having a powerhouse rhythm section like Chris Layton (drums) and Kevin McCormick (bass) makes the entire gig more presentable and helps the other musicians blend into the Hendrix songs. What you will witness at one of these shows is quite a display of musicianship, primarily guitar heroes having a really good time. The music of Hendrix is timeless as is his legend and persona. With that thought in mind, how do all these current artists interpret the music of this fabled performer? The wide array of styles with the musicians tells the tale. With Billy Cox, you have the living legend, the reigning high priest of The Electric Church. He is the only one left and he has done a great job of playing bass and singing in a live setting, as he did last evening. Having Billy as the main cog in the wheel for this presentation is key to its success. One of my favorites, Eric Johnson, kicked off the night with Dweezil Zappa. This was the segment of the show I enjoyed the most. Actually, anytime Eric took the stage it was enjoyable. Eric’s sound is instantly recognizable, as it is with most high-level players. One has to remember that Dweezil is excellent as well, the fact alone that he mastered father Frank’s music is an incredible feat. One of the more consistent presences on stage was Mato Nanji. Not a name that is as well known as some of the others but he was part of the act at least 75% of the time and he was consistently excellent emulating Jimi’s music. Another treat was The Slide Brothers. Calvin Cooke and Chuck Campbell. Man did those to wail away at every opportunity! The added a dimension to the music that made it all more as close to the original sound as possible. They were the X factor of the night. One of the many high points of the evening was Johnny Lang with his powerful vocals and guitar playing. I thought his vocals were the strong point in regards to the songs covered. He is more of a straight-ahead bluesman with no tricks or fluff. Sometimes that is just what the doctor ordered and he is a good fit for Jimi’s music. And I cannot forget the vocals of Henri Brown, who brought the sold-out crowd to its feet towards the end of the night. Then Dave Mustaine of Megadeth came out and played. He did an admirable job with his flying V guitar. And towards the end of the show was the Three Amigos, Joe Satriani (guitar), Doug Pinnick (bass) and Kenny Aronoff (drums). Now, this was a picture I could not forget as all three do not have one hair follicle to show, if they painted themselves blue, they could pass for that other group we all know. All of that aside, this was the highlight of the evening I would think for most guitar fans. Kenny was a madman on those skins, he is so fast and so powerful after all these years, age has not affected him one bit. Pinnick with has bass hanging nearly to his ankles, and he can still reach it, by the way, sounded a lot like Jimi when he sang. For me, Satriani has been a favorite since his first release back in the 80s. This night however I did not appreciate him as much. The idea here I would think is to play Jimi’s music but in your own way and still keeping with the original sound as much as possible. Joe likes to use that whammy bar and make squealing sounds and such. I am not a fan of that so much. So, from my point of view, I wanted to see Joe that masterful guitar player, crank out the music of Hendrix minus all of the extra effects. He needs to save all that flashy technical playing for his own shows. This is a matter of personal taste and opinion and I am sure plenty of fans enjoyed that part of the show. And lastly, I need to give the nod to blues legend Taj Mahal. The man is getting on in years but can still belt out the blues and play that six-string. That is a lot of talent to witness in one concert and it is a night I never will forget. The bottom line is respecting and celebrating the music of the greatest guitar player that walked this earth. That is the reason for the Experience Hendrix Tour. They do succeed with an amazing show that runs for 2.5 hours. It is a must-see affair. 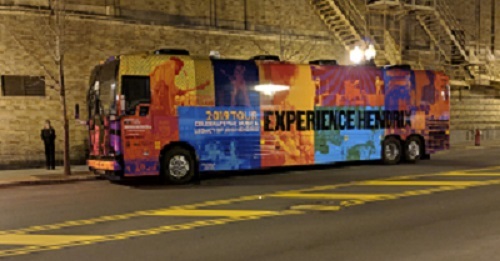 So, are you experienced?